Shortly into the New Year, on Saturday, 20 January, the newly appointed Goodwill Ambassador of the United Nations Population Fund (UNFPA) and a Spokesperson for the German Foundation for World Population (Deutsche Stiftung Weltbevoelkerung (DSW), Alfred Biolek, raised the profile of the reproductive health needs of the world’s more than one billion adolescents. 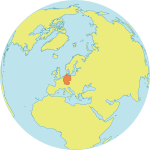 He did so by appearing in Germany‘s most popular Saturday night television programme, “Wetten, dass?“ and talking about his activities to fight against unwanted pregnancies and sexually transmitted diseases, including HIV/AIDS. 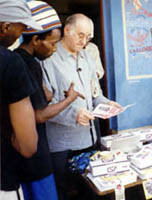 Mr. Biolek at a youth centre in Soweto, South Africa. Mr. Biolek‘s participation in “Wetten, dass?“ not only raised awareness of the reproductive health needs of young people in developing countries, but also explained his role as Goodwill Ambassador to a wide German audience. The show was the start of a larger awareness campaign, which will emphasize Mr. Biolek‘s engagements with the UNFPA and the DSW, with advertisements, events and further media activities. Reaching an audience of more than 15 million people, the Goodwill Ambassador asked his viewers to support his project to establish a youth centre in the township of Soweto, South Africa. The centre would provide support, training and counselling on HIV/AIDS and on the prevention of teenage pregnancies. In addition to a donation hotline, Mr. Biolek launched an Internet auction of the personal effects of some celebrities. The auction will last for one year, beginning with a series of gifts from prominent guests of the television programme. Among others, the singer, Chris de Burgh, has already donated a signed guitar and the Riverdance dance group has provided a pair of handmade original Riverdance dancing shoes.